Your skin is how you present yourself to the world. It is important to keep this first impression healthy not only to look at, but for our long-term well being. The skin on our face can be challenged throughout our lives, from the first acne of our teenage years to the wrinkling of our later years. If you are prone to acne, choose a cleanser specially formulated for acne. These products often contain salicylic acid or benzoyl peroxide, which help to clear acne sores. Clean your face gently, as trauma to the acne breakouts may worsen the acne or cause scarring. Avoid harsh mechanical scrubbing of skin and picking at lesions. Try to minimize your use of facial moisturizers. If you need to use a moisturizer, use only light, non-comedogenic moisturizers, which do not aggravate acne. Also, women should use an oil-free foundation, as heavy makeup or other cosmetic products that block pores may cause a flare-up of acne. Roughness, wrinkling, irregular pigmentation, inelasticity, enlarged sebaceous (oil) glands, precancerous and cancerous lesions sometimes occur with aged and photoaged skin. Sunscreens and sun protection are important to prevent further progression of photoaging. Furthermore, smoking has been shown to accelerate aging of skin, so stopping smoking is important for good skin health. In addition, a well-balanced diet — with or without a multivitamin — helps skin get the nutrition it needs to help repair ongoing damage from the sun and other environmental elements. 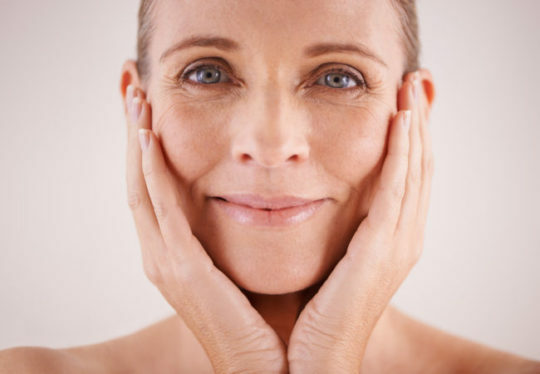 Many topical non-prescription and prescription products are currently available for anti-aging purposes. Retin-A is a prescription medication initially developed to treat acne. In addition, it was discovered that it also improved skin texture and color when used over an extended period of time. Tretinoin exfoliates the skin (removes a dead layer of skin cells), helps even out pigmentation and minimizes fine lines. Many people can benefit from using tretinoin or related products at bedtime followed by a cream or lotion containing glycolic acid. Side effects of tretinoin include redness, peeling, tightness and swelling. You may be able to minimize side effects by initially using tretinoin every other night and then, over the first month, gradually increasing the frequency to nightly. Tretinoin also makes the skin more sensitive to ultraviolet rays from the sun, and we recommend use of a broad-spectrum sunscreen in the morning. Alpha hydroxy acids (glycolic, lactic, tartaric and citric acids) are ingredients of numerous skin products. In the United States alone, there are approximately 185 manufacturers of products containing AHAs. Creams and lotions with AHA may help with fine lines, irregular pigmentation, and age spots, and may help decrease enlarged pores. Side effects of AHAs include mild irritation and sun sensitivity. For that reason, sunscreen also should be used every morning. Salicylic acid also has been studied for its effect on photoaged skin. It exfoliates skin, and can improve the texture and color of the skin. It penetrates oil-laden hair follicle openings and, as a result, also helps with acne. There are many products available that contain salicylic acid. Some are available over the counter, and others require a doctor's prescription. Hydroquinone is a bleaching agent that is used to remove hyperpigmentation, such as age spots and dark spots related to pregnancy, hormone therapy or excessive sun exposure.